Hey, guys! I gave it some thought have decided to keep the travel tips and guides here again and use The Travel Chasers as a diary of Dillon and my trips together. Maintaining two blogs at the same time is tough and I can only put all my focus on one at a time. This article was inspired by my trip to the Philippines from the US with my family for the holidays. I thought it would be a great idea to share some of the tips I use when packing for an international trip. For me, any trip that is two weeks or longer is considered a long time although I would love to stay even longer but someone has to pay the bills! If you are traveling far, I think it is worth it if you stay at least two weeks because transportation is expensive and you have a long travel time to make up for along with losing a day due to time difference. Traveling for two weeks straight is usually the most time I could get off as a full-time student and even now as a full-time employee if I am lucky. 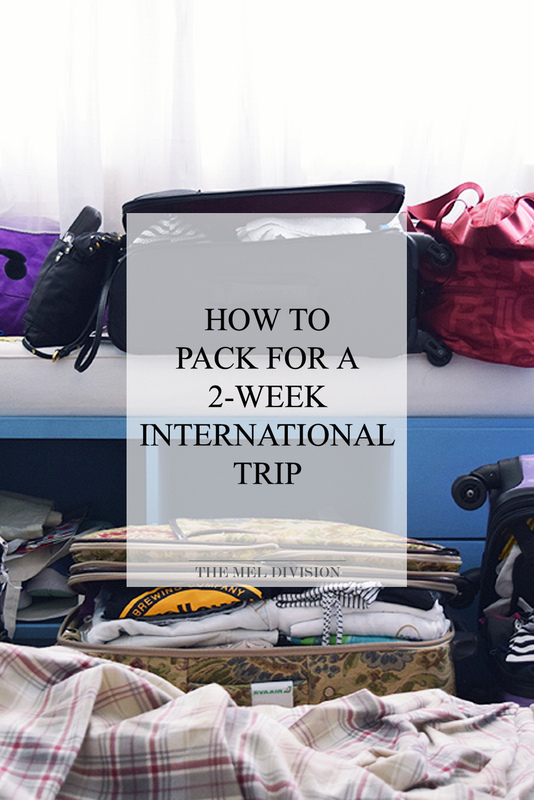 If you need help figuring out how to pack for a two-week international trip like mine, keep on reading! 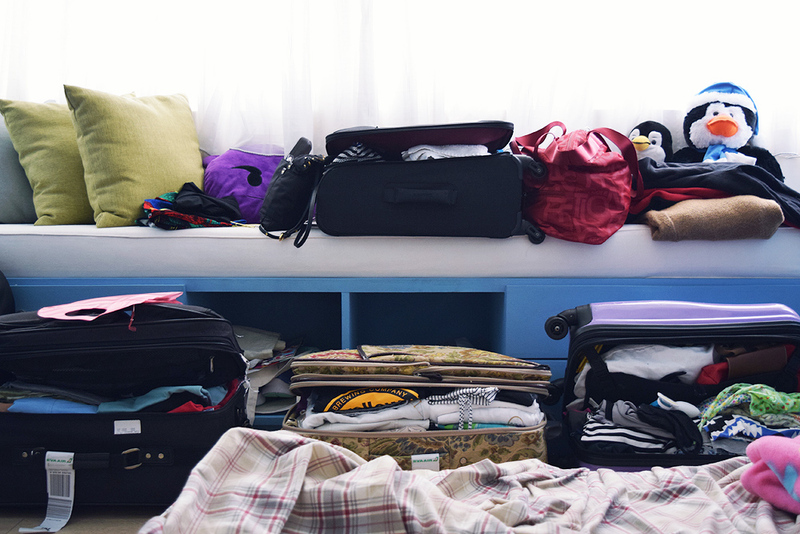 Choose your outfits before you pack - This way, you are sure your outfits will match and it will save you time the day you wear them rather than wasting those precious minutes you could be exploring. Carry travel-sized amenities that are less than 3.4oz - I save all my travel-sized products ahead of time so I don't have to worry about picking something up after checking into the hotel. From contact solution to moisturizer to hairspray. Bring snacks - If you are like me, I can not go for hours without having a snack. I always take some with me especially if you are traveling for a long period of time. Designate who brings what - When I am with my friends, we would give one person the role of bringing a straightener for our hair and another person brings the toothpaste. Pack as little as possible - I know I always end up shopping for souvenirs but they need a place in the luggage so pack only what you need for your trip. I know those extra pair of shoes would look nice with one of your outfits but you have to compromise. Otherwise, wear what you buy if its wearable and that way you can pack less clothes! Pack any medications you may need in case of emergency - You never know if you might get sick. Bring cash with you - If in case your credit card gets rejected or stolen or a merchant does not take card, you are prepared. Depending on where you travel, many places may only take cash. Store your cash in different places - I like to bring a certain amount of cash I plan to spend and just a little more for emergency, then keep them in different safe places (e.g. wallet, luggage, safety pinned in my pocket, etc.). This way, if I were to misplace or lose my money, it won't be all in one place. Just do not forget where you put them. Make sure you pack enough underwear - This may sound silly but it can be easy to forget something you wear every day because you don't even think about it anymore! Store any liquids in plastic bags - The change in cabin pressure on a plane can pop any bottles of fluids so keep them secured. Otherwise you may end up with stains all over your clothes and electronics. Store electronics in a place that is easy to access - If you like using your electronics while traveling, keep them in a place that is easy to reach. It also helps move the line along when you may be required to take them out anyway at security checkpoint. Hope you enjoyed reading these tips! Stay tuned for more!